A teacher and two aides from a Florida school for the disabled have been accused of locking students with autism in a darkened bathroom as punishment and other abusive actions, investigators told the Miami Herald. A teacher's aide at Silver Sands — a school for children with disabilities in Fort Walton Beach — reported the alleged abuse to the school resource officer, Okaloosa County Sheriff Larry Ashley told the paper Monday. Teacher Margaret Wolthers, 48, and aides Diana LaCroix, 52, and Carolyn Madison, 47, were responsible for several incidents involving a 10-year-old and two 8-year-olds from Sept. 1 to Nov. 14, the sheriff's office told the Herald. "Investigators say on different occasions the teacher and aides 'intentionally and maliciously' blew a whistle in the ear of a child with a low sensory auditory threshold who wore earphones to protect him from loud noises," the department said in a news release, according to the paper. "They also threatened him with a whistle." Wolthers, LaCroix, and Madison blew the whistle within 7 inches of the child's ear, the Herald reported, citing warrants. "This was done while holding the victim's arms down keeping him from protecting himself by covering his ears," an investigator wrote in the warrants, according to the paper. The adults also placed three students "individually, and on separate occasions in a classroom bathroom with the door closed and lights off as punishment for misbehavior," the sheriff's office said, the Herald reported. "Classroom aides who witnessed the incidents say the victims would scream and cry when placed in the bathroom, and that one was contained for up to 90 minutes," the release noted, according to the paper. 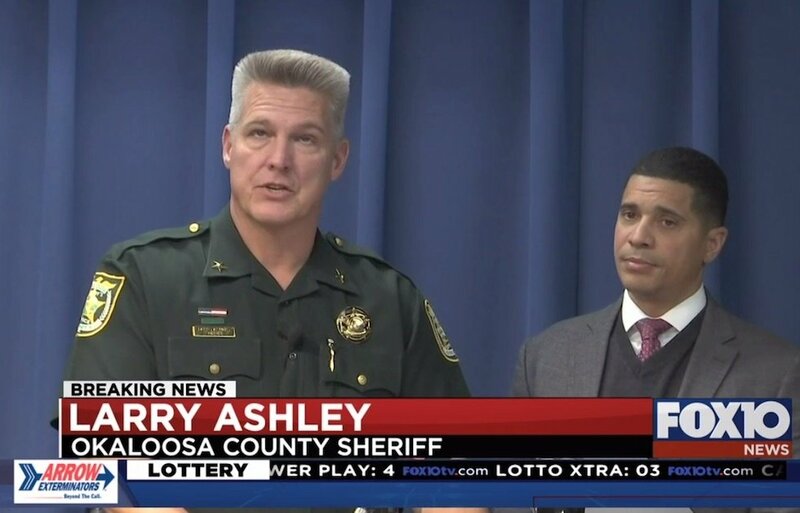 Ashley added in a Monday news conference that the school's principal "confirmed that the school policy does not allow for seclusion without supervision as a form of punishment and is prohibited. Likewise, holding a student captive while blowing a whistle in their ear is not an acceptable form of discipline or proper protocol of correcting this behavior," the Herald reported. The sheriff added that one of the accused educators is the wife of a deputy, the paper said, but he didn't specify which one. Wolthers, LaCroix, and Madison face charges of aggravated child abuse and were given until the end of Monday to turn themselves in or have warrants issued for their arrests, WALA-TV reported. None appeared in online jail records as of late Monday night, the Herald reported. Ashley said the abuse was "considered ... an acceptable practice" at the school "so it had been going on for some time," the station added. The teachers and aids have been with the school system ranging from 13 to 21 years. These alleged incidents happened between September and November of last 2018. The teachers have all been on paid administrative leave since and according to Okaloosa County Schools Superintendent, Marcus Chambers they're expected to be suspended without pay at the next School Board meeting. An elementary school guidance counselor from a different school in the same district was accused Monday of not reporting the sexual abuse of a 5-year-old, sheriff's deputies told the Herald.